I can’t remember why it started – I think my mom might have called earlier the day of the race and mentioned that it was going to be on TV that night. But I do remember the exact day it began – Aug. 22, when NASCAR was in Bristol, Tenn. The drivers took the next weekend off and Big Guy missed Labor Day weekend because we were out of town. With those exceptions, though, it’s been a regular ritual since then for a boy in California and his grandmother in West Virginia. Living on opposite coasts, they rarely see each other. But they’ve bonded over racing, a boy just learning the sport and a woman who’s never had anyone who’s shared her enthusiasm. Mawmaw’s been a NASCAR fan for a decade or so, watching the telecasts each week while Pawpaw grumbles and eventually falls asleep. I’m not sure how that started either – maybe she needed something to fill the time between West Virginia University sportscasts now that the kids were all out of the house. Big Guy knew little about motorsports beyond Lightning McQueen, but when he heard his grandmother say “fast cars” that August evening, he had to check it out. When the first crash occurred, he had to pick up the phone. They were on the phone for the next two hours, hanging up only when the battery on Mawmaw’s cordless died. A rookie mistake – she’s since learned to start the race with a full charge. Mawmaw likes Jeff Gordon – I’m a casual fan and lean that way, too – and Big Guy started out in his camp until he discovered Ryan Newman and the Army car. Dad trumped Mom and Mawmaw in that case. In many sports, though, it’s often as much about who you don’t like as it is about who you admire, and in that spirit Mawmaw has indoctrinated Big Guy that the M&M driver is evil. “He’s a crybaby,” Big Guy tells me. He had to admit when we were at Fontana two weeks ago that the M&M car is cute, and he allowed himself to root for it when George Bush – that’s who he thinks drives the car – got sick and someone else took the wheel. He was apologetic when he called Mawmaw as we drove away from the track. “It’s OK for me to like the car if there’s another driver, isn’t it?” She conceded that one. He’s learned many of the drivers in the weeks since, including Boots’ favorite Pon Pablo Montoya, Mart Martin and Tony Stewer. He still thinks they’re competing for the Piston Cup, though. He has to dress for the race, too, and no one’s had the heart to tell him he’s actually wearing a motocross uniform. 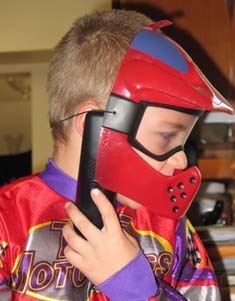 He didn’t want the NASCAR Halloween costume because it lacked a helmet and didn’t look official enough. And he still makes sure he calls Mawmaw every week for expert analysis that Mom just isn’t qualified to provide. At long last, Mawmaw has found someone to watch the race with her.